Our Smart jet Pro Complete Airbrush System includes everything you’ll need to get started with airbrushing. Because of its versatility, you’ll be able to use this system for many projects including HD / SFX makeup, plastic models, dioramas, automotive art, signs, props and t-shirts. Ideal for both novices and professionals. FREE SHIPPING (Continental USA). Fulfilled by Graftobian. IMPORTANT INFORMATION: The Cleansing Fluid included with this system is flammable and considered hazardous material (HAZMAT). Due to HAZMAT regulations, this system can be shipped by ground shipping only within the continental USA. This complete system includes everything you’ll need to get started with airbrushing. 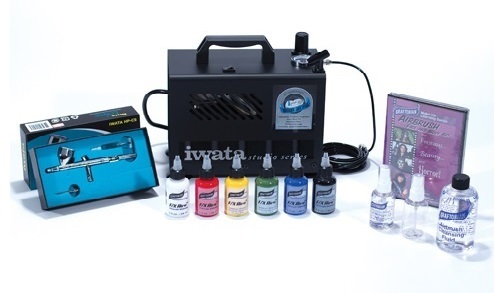 It comes with an Iwata Eclipse HP-CS airbrush, one of the most popular airbrushes, known for quality and versatility. 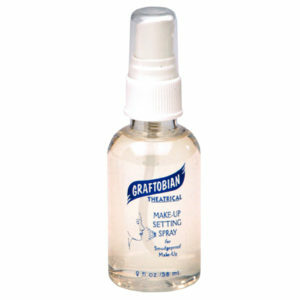 This airbrush system comes with special effects makeup and includes the F/X Aire™ airbrush makeup. Because of its versatility, you’ll also be able to use this system for many other projects including plastic models, dioramas, automotive art, signs, props and t-shirts. It is ideal for both novices and professionals alike. Iwata has a reputation for producing quality brushes and is thus one of the most popular airbrushes. Each Iwata airbrush is spray-tested before shipment to assure maximum performance and adherence to Iwata’s strict quality standards. 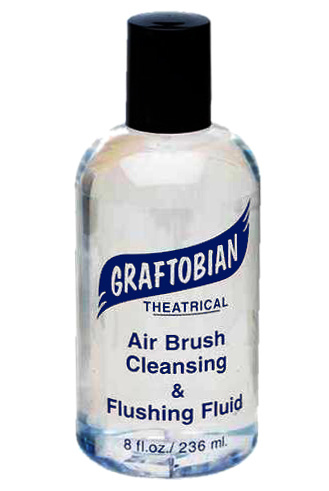 There are two fundamental considerations when purchasing an airbrush – the airbrush itself and the compressor. With so many airbrush choices, you’ll want to know which airbrush to choose. 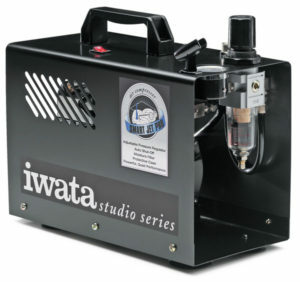 We recommend selecting a gravity feed airbrush, dual action, internal mix airbrush from a name brand such as IWATA. This airbrush is a gravity feed, and features a unique 0.35mm needle, nozzle and nozzle cap combination for fine-detail spraying, but with a high-paint-flow capacity. It also features a generous 1/3 oz. sized cup, designed with a tapered shape that is easier to clean up and has a more efficient paint flow. 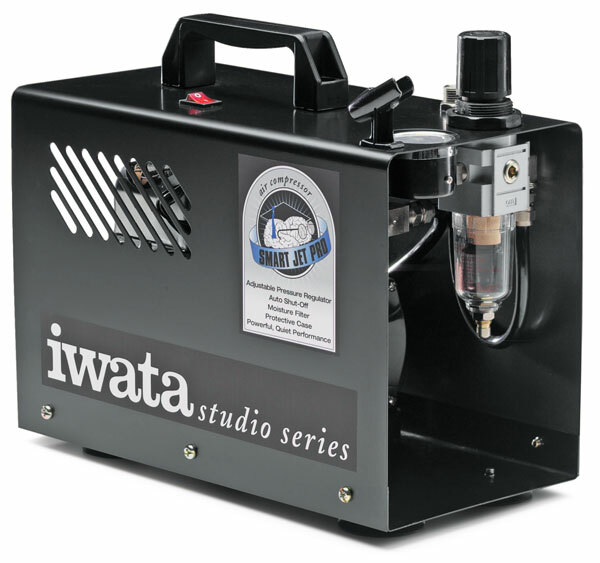 The Iwata Smart Jet Compressor is a good beginner choice. At 35 psi, the ideal air pressure to utilize all of the airbrush’s unique potential, the Eclipse’s versatility provides high-paint flow for background spray as well as for controllable fine line detail performance. This unmatched versatility is a unique feature of the Iwata Eclipse airbrush series. The Iwata Eclipse HP-CS is easy to use, clean and maintain. It comes with an 8 oz. bottle of Graftobian airbrush cleansing fluid.